The new OMEGA™ PX5200 is a compact wet/wet differential pressure (dP) transmitter, ideal for flow and tank level applications where reliable, low dP measurements are required. 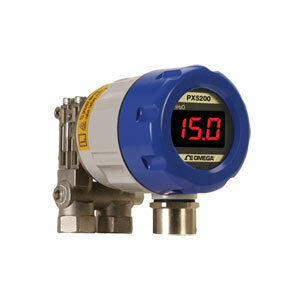 Equipped with a solid state sensor and a 316 Stainless Steel isolating diaphragm, the PX5200 can monitor a wide variety of wet liquids or gases and dry gases. Available in unidirectional ranges from 0 - 4 inH2O (10 millibar) to 0 - 400 inH2O (996 millibar) and bi-directional ranges up to ±200 inH2O (±498 millibar) the PX5200 operates on line (static) pressures up to 300 psi (20 bar). A rugged aluminum NEMA 4X (IP65) enclosure measures only 65 mm (2.56") in diameter and incorporates a backlit LCD display for local reading. The output is a two-wire configurable 4 to 20 mA signal that can be adjusted to re-range the transmitter or "tare" unwanted fluid head preloads. In addition, this instrument offers flow measurement/square root extraction, where the indicated flow rate and analog signal can be displayed. Rangeability for zero and span are from -10 to 110% FS URL (Upper Range Limit). This means a 20 inH2O transducer can have the zero set between -2 inH2O to FS 22 inH2O. Span can be set over that range also. For example zero could be set for 2 inH2O and 22 inH2O maximum so the output would be 4 mA at 2 inH2O, midpoint 12 mA would be 12 inH2O and 20 mA would be 22 inH2O. Note: Accuracy and output resolution based upon FS URL (upper range limit) value. All dollar amounts on this site are shown in Euro currency. Note: Comes complete with mounting bracket and operator's manual.